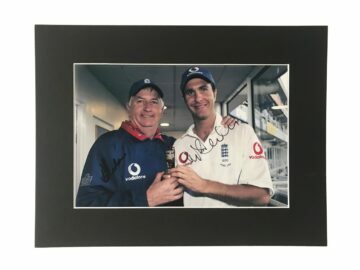 Shop our signed England cricket memorabilia featuring hand signed autographs from players in the England international cricket team. 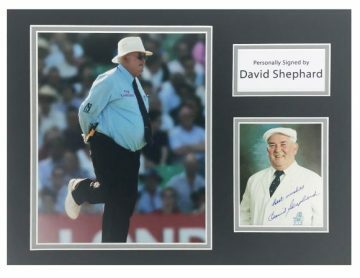 The signatures are featured on cricket bats, balls and photos as well as signed England cricket shirts & photo displays. All items come with a Certificate of Authenticity, free UK delivery and fast worldwide shipping. Many come with signing proof. Modern cricket originated in England – so it’s fitting that the English side is still one of the most formidable in the sport today. The very first recorded instance of cricket being played in England was as far back as 1739 – by the mid-1800s it was firmly entrenched as one of England’s favourite sports. As it gained prominence tours started to take place – first in America, and then in Australia as the American Civil War took hold. This was to be the start of a lifelong rivalry between the two countries – as the English side went down under for a very successful tour. By 1882 the Australian side had the advantage, upsetting English cricket fans. The Sporting Times promptly wrote an obituary stating that cricket had died – and ‘the body will be cremated and the ashes taken to Australia.’ With that, the now-famous Ashes tournament was born. Every two years a match is played exclusively by England and Australia, with each country taking turns to host the contest. As of November 2018, the national England team has played 1005 test matches, winning 362, drawing 345 and losing 298. They’ve also won the Ashes on 32 occasions. Out of 721 One Day Internationals, they’ve won 360. Cricket remains one of England’s most popular spectator and participation sports – with around 850,000 people playing the game nationwide. Spectators flock to various stadiums up and down the country including The Oval and Old Trafford – and around 65% of the population keenly watch domestic and international matches. 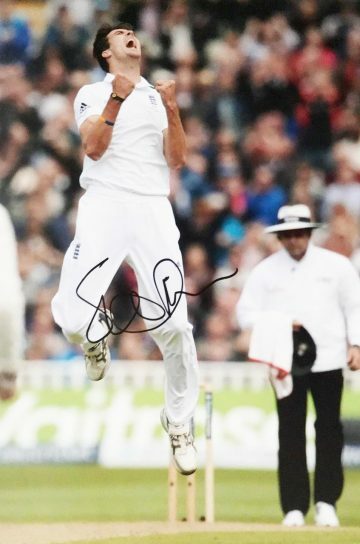 Here at Firma Stella you’ll find a treasure trove of signed England cricket memorabilia. Autographed by some of cricket’s biggest stars of the years, including Ian Botham, Joe Root and Freddie Flintoff. 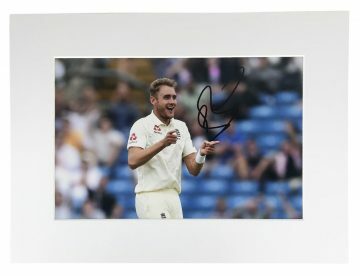 Signed England cricket bats, balls, caps, photos & shirts. Each and every item comes with a certificate of authenticity as standard – whether you’re showing off your memorabilia in your sports room, or saving it as an investment for a rainy day.